From the bridge that leads into the night market in Siem Reap, walk south, keeping the river on your left. (This road is route 63, Russei Luk / Lake Road.) After a few minutes, you should see a roundabout with a fountain in the middle on your right hand side. Keep walking along the river for 5 - 10 minutes. You should see a gas station on the right. 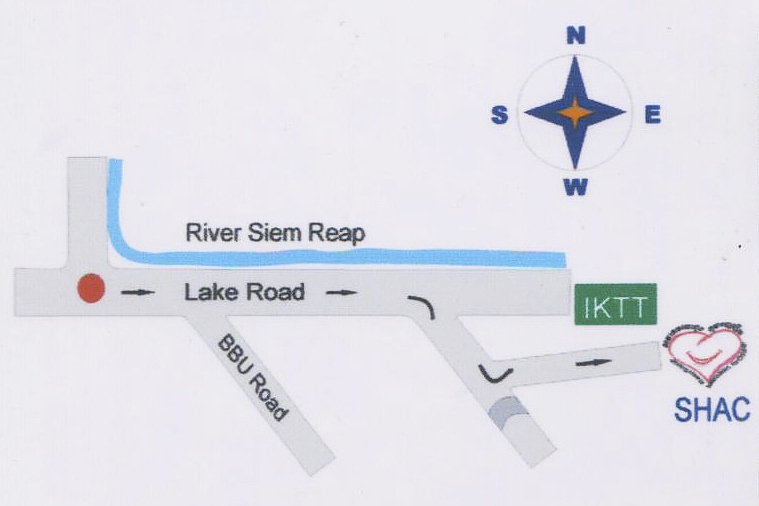 There's a large green sign for IKTT (Institute for Khmer Traditional Textiles) and a smaller Smiling Hearts Association for Children sign pointing right just after the gas station, so turn right here. Very soon, you will see a fork in the road. Take the right fork. Soon after this, you should come to a small bridge, and a Smiling Hearts Association for Children sign pointing left. So, head left and you'll see our school on the left after a few minutes.